I seem to have survived the bug that wreaked havoc on my system last week. Four days later and I'm still a little off, but I'm feeling well enough to enjoy the weekend. Last week was about my being sick, and then the kids. I stayed home with them on Thursday, with big ideas about how much I might get done being home all day - none of it happened. It's ok, lounge-around-the-house days are fun too. Now that I'm healing up, it's time to start thinking about the training plan for the San Francisco Rock n Roll half marathon coming up in April. I made a training plan last month but I haven't been following it. I'm blaming the holidays. And with that excuse over.... So I plan to run 5 or 6 miles this weekend, depending on how I feel. It's a dreary, gray misty day out today, and my tummy is still feeling funny, so I'm placing my hopes on tomorrow. Sunday is a great day to run. And I lined up a plan for when I'm with the kids so I have no excuse to not run on those weekends either. For Christmas I was gifted a new training gadget, the Garmin Forerunner 920xt. Holy cow, this thing is fancy. It's made for triathlon training and can be used for swimming (open water and pool), biking (indoor and out), and running (treadmill and outdoor). It can even track your running form and other things. I think it talks to the heart rate monitor or something? I don't understand it but I'm looking forward to what it tells me. It's hard to think about what I've signed up for without starting to freak out. Then I remind myself, "come race day, you will have trained, you'll be prepared, you're not prepared now and that's why it seems so scary, it will seem much less scary once you've prepared." Though, I'm sure, still quite a bit scary. Just look at those ladies jumping into the bay. That's going to be me?! At the moment, exercise remains a mostly weekend thing, and even then, not consistently. I'm hoping this half-marathon will inspire me to get moving more during the week. My back is still a problem, I started physical therapy but got derailed by the holidays. Once again, that excuse is gone so I need to get in to see them. PT exercises would be a great way to jump-start my gym habit. As far as eating goes, things are gently moving in the right direction. Sometimes I track but still not anywhere near 100%. Still, even occasional tracking keeps my overall awareness up. So much of this is just about remember, "no, I'm not doing that anymore, remember, Michelle?" Yes, I remember. Ok, it's after 11pm and I've got a run planned for tomorrow so I'm signing off. I'll close with a really weird lunch I had at a healthy cafe (hippie healthy, but still healthy). Won't be getting this again, not sure what I was thinking getting it once. I mean it wasn't that bad, mostly it was just weird, dried cranberries and feta are two things that don't "go" with a spicy sauce, IMHO. 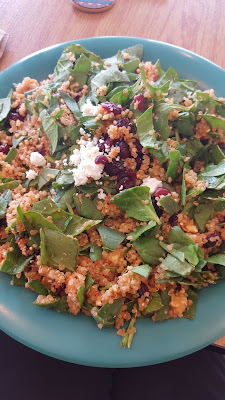 quinoa, spinach, feta, dried cranberries...and hot sauce. yes, hot sauce. Hi Michelle! Best of luck into your endeavors for 2016! Just like you, I need to tell myself to stop counting calories or anything unnatural/unsustainable habits with how I eat food. It's definitely not an overnight thing, but slowly and surely, we'll both get there! Can't wait to hear about your experience in the triathlon this summer! you'll get back to a regularity with your exercise before you know it! and wow! 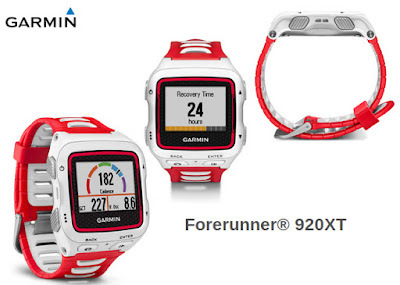 i have serious garmin-envy right now! that thing is awesome! does it bluetooth to your phone to update the garmin connect app? if so, that's awesome! and that lunch you had, i'd like it much better with something OTHER than hot sauce. Yay! Looks like you have an exciting year planned!